Termites get a pretty bad rap, probably because we think of our houses disintegrating when they move in. Ironically, we have a lot to learn from these critters, and their mounds have served as an inspiration for modern architecture. Either way… maybe, just maybe, after learning more about them, you will appreciate how interesting they are. Figure 1. 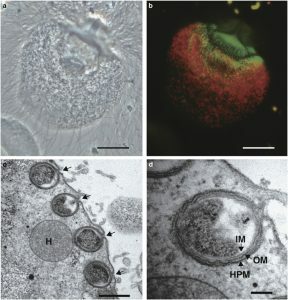 Kuwahara et al., (2017) Fluorescence in situ hybridization and transmission electron microscopy the microbes associated with the protist. Let’s focus on their most notorious trademark: their ability to basically eat wood. It wasn’t until quite recently that it became clear that it isn’t exactly the termites themselves that should get all the blame (or credit? since digesting wood is important in many ecosystems) for this talent, but instead, the microbes that inhabit their guts. In fact, it appears that all termite species (and there have been well over 2,000 described) rely on symbiotic relationships with microbes inhabiting their guts. Termites fall into two categories: (1) ‘lower’ taxa (that harbor protists, bacteria, and archaea) and (2) ‘higher’ taxa, (that just have bacteria). 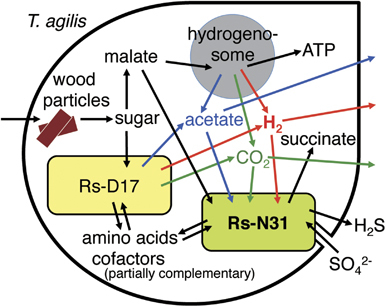 In termite guts, the protists develop symbiotic relationships with the bacteria and archea. It’s not surprising that the links between all these organisms that call the termite’s hindgut home, are difficult to tease apart. In a cool paper recently published in ISME by Kuwahara et al., the authors present the genome of a bacterium that lives in a protest cell in the termite gut. To understand the importance of their study, we have to identify the key players. First, there’s the termite, Reticulitermes speratus. This termite has a protest in its gut (Trichonympha agilis) and this protest has two bacterial symbionts that hang out in distinct locations. The symbionts are ‘Ca. Endomicrobium trichonymphae’ (which I’ll call CEt) and ‘Ca. Desulfovibrio trichonymphae’ (which I’ll call CDt). By the by, Ca. is short for Candidatus, a fancy Latin term indicating that the bacteria is known but not yet cultured. Figure 4. Kuwahara et al., (2017) Classification of genes in CDt as well as some reference organisms. A previous study published the genome of CEt, however, the precise role of CDt was still unclear. To sequence the CDt genome, the authors removed the gut from an individual R. speratus individual, isolated a T. agilis cell from its gut, then with a micromanipulator (really really small scale tool that is used with a microscope), they isolated the portion of the protist with the CDt cells. Finally using whole genome amplification, they sequenced the CDt genome, which turned out to be pretty small (1.4 Mb). In addition to the genome, Kuwahara et al., also managed to isolate the guts of ten other R. speratus termites, collect the protists in the guts, and extract the RNA to see what was being actively transcribed. Figure 5. Kuwahara et al., (2017) Proposed relationship web among the protist and CDt as well as CEt bacteria. Even with a tiny genome, CDt had the genes to do complex things, like oxidize hydrogen using sulfate or fumarate. However, it wasn’t able to use electron donors that most of it’s closely related brethren (other desulvovibrios) can handle. 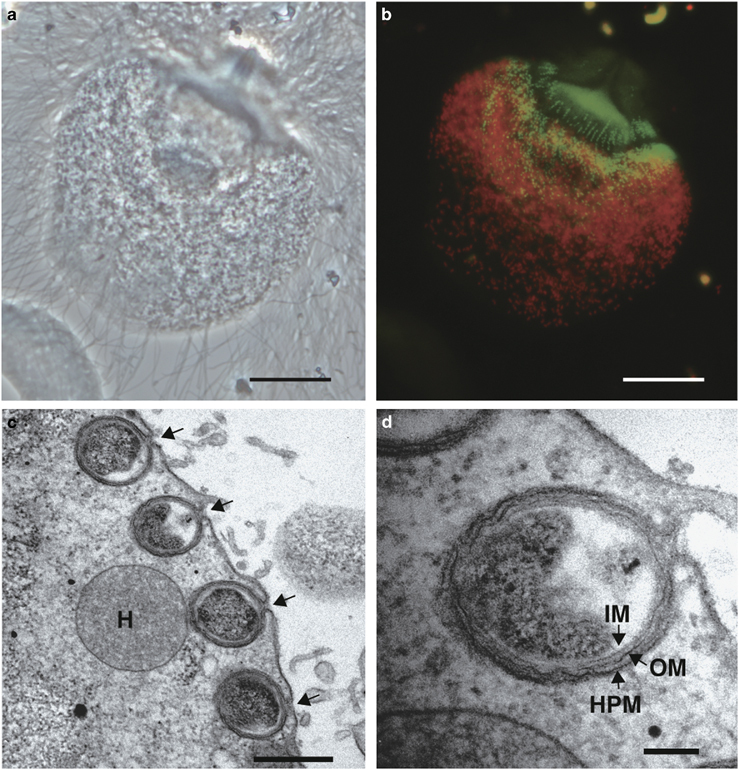 After analyzing the genome, Kuwahara and colleagues hypothesized that the ancestor of this wee bacteria might have jumped on an ancestral T. agilis cell in hopes of getting access ot more hydrogen, then over time evolved into a symbiont that couldn’t survive anywhere else. 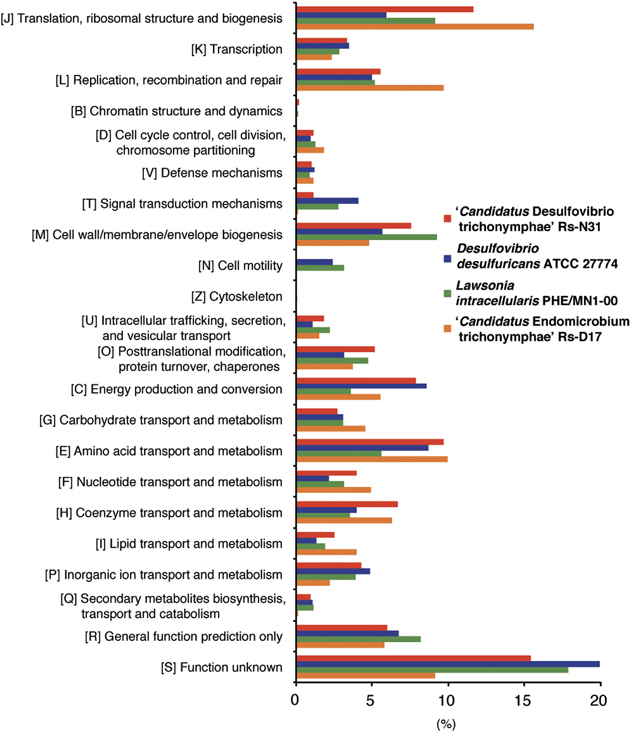 As the authors point out, there is a host of diverse Desulfovibrio strains associated with Trichonympha protists, and there remains much to be learned about these intricate symbiotic relationships. Studies like this are completely amazing. It is astounding that since 2007 (the year that gave us Ratatouille and Hot Fuzz), new sequencing technologies have literally provided tools to unravel complex relationships in nature that would be nearly impossible to even know existed otherwise. It’s interesting to think that without its symbionts, the termite wouldn’t be chucking any wood at all. Kuwahara, H., Yuki, M., Izawa, K., Ohkuma, M. and Hongoh, Y., 2016. Genome of ‘Ca. Desulfovibrio trichonymphae’, an H2-oxidizing bacterium in a tripartite symbiotic system within a protist cell in the termite gut. The ISME Journal. Turner, J.S. and Soar, R.C., 2008, May. Beyond biomimicry: What termites can tell us about realizing the living building. In First International Conference on Industrialized, Intelligent Construction at Loughborough University. 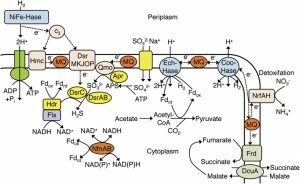 This entry was posted in Coevolution, evolution, genomics, microbiology and tagged Desulfovibrio, protist, symbiosis, termites, whole genome amplification. Bookmark the permalink.